I can’t recall the amount of times a good cup of coffee in combination with a sweet treat often became my saviour during long days spent in class and even longer nights spent studying. Oh, how I wished then there could have been a delicious way for me to combine both… Oh, but wait, there is! Presenting (undoubtedly) one of my new personal favourites: coffee cookies! These combine the delicious taste of cookies and coffee into one treat! Am I in heaven? I surely must be! 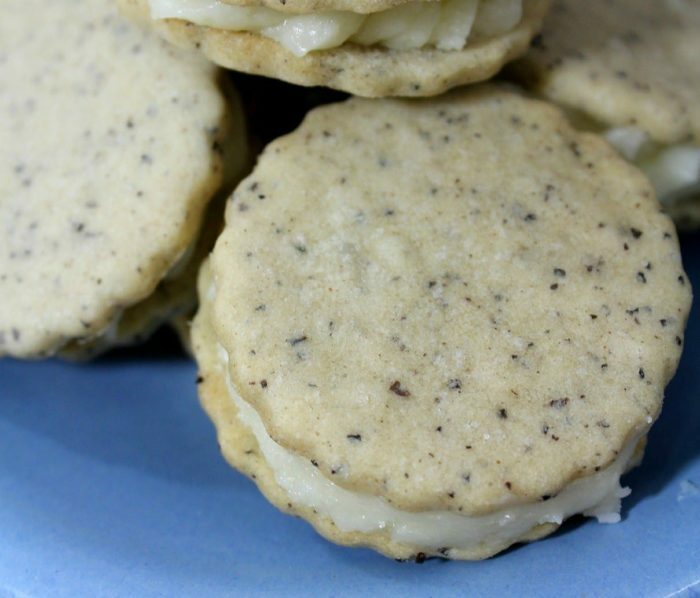 Whether you’re looking to please the coffee aficionado in your life, or searching for a new recipe to add to your repertoire, you won’t be disappointed with these delectable Coffee Sandwich Cookies‏! Begin to slowly add the egg mixture to the butter mixture. Mix well Slowly add flour mixture until fully combined, do not over mix. Place the dough in your refrigerator for at least one-two hours. Melt the butter in a small saucepan on low heat. Once the butter is melted, add brown sugar and heavy cream. Stir the mix constantly over medium heat until sugar is dissolved. Now add the salt. Make sure to allow it to bubble for 2 minutes. Remove from heat and allow to cool (1 hour minimum). Beat in powdered sugar 1 cup at a time, until you reach desired consistency. I hope you enjoyed the Coffee Sandwich Cookies‏ Recipe. If you make it, make sure to share with us on Facebook or Twitter! Also, check out all of our other Recipes. Melt the butter in a small saucepan on low heat. Once the butter is melted, add brown sugar and heavy cream. Stir the mix constantly over medium heat until sugar is dissolved. Now add the salt. Make sure to allow it to bubble for 2 minutes. Remove from heat and allow to cool( 1 hour minimum). Beat in powdered sugar 1 cup at a time, until you reach desired consistency. These could be a nice snack when having friends over. Thanks for the recipe! m\\ these look absolutely perfect, trying this! Hmm These are the perfect snack to have with tea. Wow, these cookies look absolutely delicious! I agree with you, there is nothing better than a hot cup of coffee and a treat! 🙂 I will definitely be making these soon, thank you so much for sharing! Thanks for sharing a great recipe, I’m always looking for new cookie recipes and these sound great!! I love this idea but I do wonder if the ground coffee doesn’t make them seem bitty. I think I’d rather use Nescafe that should work too shouldn’t it? I would try it. Best way of finding out and let us know! Those look perfect for a sweet treat! How lovely! These would be perfect for a formal tea! I am always up for trying a new cookie recipe. These look and sound very good. These look great! I’ll have to try this the next time the grandkids are over. They’ll be so excited. I am such a sucker for sandwich cookies. These ones sound right up my alley! Oh my goodness! I need these! Anything with coffee in it quickly becomes my favorite! My mouth is watering just looking at the recipe! Can’t wait to give it a try! A perfect addition to my morning coffee! I love anything with a coffee flavor so I’m sure I’d love these. What a yummy sounding recipe – I must try this one! These are such a unique cookie flavour. And I love how they look. These sound like something my Mom and brother would love! I bake cookies every year as gifts. Wow all of the recipes you post look so good . I love the sound of this one . Wish I had more spare time I’d try them all . Finally got around to trying these,so delicious ! Thanks! These look so yummy! Thank you for sharing the recipe. « Ovarian Cancer Awareness Month: Let’s Break Out the Teal!